Ursprünglich als luftverlastbarer Panzer entwickelt, wurde das Fahrzeug nie von den USA in dieser Funktion während des Zweiten Weltkriegs eingesetzt. Da der US Air Force Frachtflugzeuge mit ausreichender Ladekapazität fehlten, verlor das U.S. Army Ordnance Corps das Interesse an einer Weiterführung des Projektes. The Locust is a fast and small tank, reaching its top speed of 64kph pretty quickly regardless of terrain. Differences with its German counterpart, the T-15, include higher penetration, while being much less maneuverable and having a somewhat lower view range. Thus, it's not capable of driving in tiny circles at full speed. However, Improved Ventilation, a fully trained crew, and some driving experience with this tank can help neutralize these drawbacks. The M22 Locust is a fast and fun tank to play. When scouting, don't rush out too far; the radio range of the M22 is limited. The 37 mm M-6 gun penetrates well for its tier and can shred opponents with its high rate of fire. However, keep a close eye on your ammo stock and don't waste shots because the limited supply of 50 shells runs out quickly. Also keep in mind that the gun cannot pen tier V tanks unless you use your speed to flank them and put shots into their weak spots. Even APCR will struggle to penetrate, as the pen is just slightly above the base armor of many tier 5 heavies. However, with your very high camo rating (Especially with camo net, paint, and crew skills) you can be a very effective passive scout in these tier 5 matches. Mounting binoculars will make you much more effective in this role. Mounting coated optics as well will allow you to switch between the roles as needed. In a rank 3 match you can use your high speed to get into early scouting positions or even active scout. If you're feeling particularly brave it can be quite an effective harasser and flanker. You should avoid tight turns that bleed your speed off too much. Sometimes it's better to go in a straight line into the next bit of cover. The Light Tank (Airborne) M22, also known as the Locust, began development in late 1941 in response to a request by the British military earlier in the year for an airmobile light tank which could be transported onto a battlefield by glider. At the time the request was made, the War Office considered using the equipment in Britain's fledgling airborne forces, which had been formed in June 1940 by order of the Prime Minister, Winston Churchill. When officials at the War Office examined the equipment that would be required for a British airborne division, they decided that gliders would be an integral component of such a force. These gliders would be used to transport troops and heavy equipment, which by 1941 was to include artillery and some form of tank. Plans to transport an airborne tank went through a number of revisions, but by May 1941 it was considered feasible for a tank weighing 5.4 long tons (5.5 t) to be carried for 300 to 350 mi (480 to 560 km) in a glider, although the latter would have to be specifically designed for the task. In a conference held on January 16, 1941, it was decided that the General Aircraft Hamilcar, under development at the time, would be used to transport a single tank or two Universal Carriers. A decision had recently been made by the War Office that light tanks were no longer to be generally used in the British Army; on the whole they had performed poorly during the Battle of France and were considered to be a liability. As a result the Vickers-Armstrong Light Tank Mk VII Tetrarch light tank was now considered obsolete. This made it available for use by the airborne forces and it was chosen by the War Office as the tank to be transported by glider. However, it had not been designed specifically as an airborne tank or to be airmobile, and it also possessed several faults. Its size limited the possible crew to three—a driver in the hull and a gunner and commander in the turret—which was found to be too few crew members to operate the Tetrarch effectively. The gunner or commander, in addition to their own duties, had to act as loader for the 2-pounder, which caused delays in combat; a report on the tank written in January 1941 stated that since the commander had both to fight and control the tank, controlling a troop of Tetrarchs during combat would be almost impossible. The War Office was also aware that the tank had a faulty cooling system that made the Tetrarch unsuitable for service in hotter climates, such as the Middle East and North Africa. A purpose-built airborne light tank was therefore required to replace the Tetrarch, but the decision was taken by the War Office not to produce the tank in Britain due to a lack of production capacity. Instead the American government was approached with a request that it produce a replacement for the Tetrarch. This request was made by the British Air Commission in Washington, D.C., with a proposal calling for a tank of between 9 t (8.9 long tons) and 10 t (9.8 long tons) to be developed, this being the maximum weight the War Office had decided could be carried by current glider technology. The proposed tank was to have a primary armament of a 37-millimetre (1.5 in) main gun and secondary armament of a .30-06 Browning M1919A4, and a crew of three. The specification also called for a maximum speed of 40 mph (64 km/h) and an operational radius of 200 miles (320 km). The turret and front of the hull were to have an armour thickness of between 40 millimetres (1.6 in) and 50 millimetres (2.0 in), and the sides of the tank a thickness of 30 millimetres (1.2 in). The United States Ordnance Department was given the task of developing the proposed tank, and in turn requested designs from three American companies: General Motors, J. Walter Christie and Marmon-Herrington. The design offered by Christie in mid-1941 was rejected as it failed to meet the specified size requirements, as was a modified design the company produced in November. 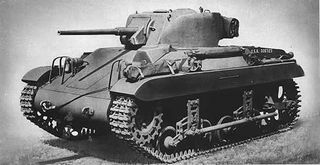 At a conference in May 1941, the Ordnance Department chose the Marmon-Herrington design and requested that the company produce a prototype tank, which was completed in late 1941; it was designated the Light Tank T9 (Airborne) by the company and the Ordnance Department. The T9 had a crew of three and weighed 6.7 metric tons (7.4 short tons). It was armed with a 37-millimetre (1.5 in) main gun and a coaxial .30-06 Browning M1919A4 machine-gun, as well as two further machine-guns on the right-hand side of the bow. The main gun and coaxial machine-gun were mounted in a powered turret, which also had a gun stabilizer installed to allow the gun to be fired when the tank was moving. The T9 was powered by a 162 horse-power six-cylinder, air-cooled Lycoming engine, and the thickness of the armour varied; the front, rear and sides of the hull had a thickness of 12.5 millimetres (0.49 in) while the sloped portions of the hull had a thickness of 9.5 millimetres (0.37 in). The tank's engine was able to give it a maximum speed of 40 mph (64 km/h). The T9 was not primarily designed to be transported by glider, a significant change from the original request, but instead was to be carried under the belly of a Douglas C-54 Skymaster transport aircraft, using four lifting brackets welded onto each side of the hull of the tank. The turret was designed to be removable so that it could be detached and transported inside the C-54 and reattached once on the battlefield. The loading took six men about twenty-five minutes, the unloading ten minutes. On top of this the aircraft required a proper airfield on which to land. However, the T9 was of the correct shape, weight and size to be carried inside a Hamilcar glider, suggesting that these dimensions had been chosen deliberately so that the tank could be transported inside a glider if required. A large, bulky glider with long wings in flight, coming in to land on a runway. It is casting a shadow to its right on the runway. Fields can be seen behind it, and there are trees and bushes in the background. A Hamilcar Mark I glider in flight. Hamilcars were used to transport the Locust into battle. A number of changes were made to the prototype during testing. The main change was the addition of supporting steel beams to improve and strengthen the suspension of the tank, which increased the weight to 7.05 metric tons (7.77 short tons), the maximum weight that could be carried by a Hamilcar glider. Two new prototypes were ordered by the Ordnance Department in January 1942 and were delivered by Marmon-Herrington in November 1942. They were both designated T9E1. The new tanks incorporated a number of requested changes. The turret was altered in shape; it was lightened by the removal of the power traverse mechanism and the gyro stabilizer for the main armament. The front of the hull was altered from a stepped appearance to a more sloped profile, which would provide for a better ballistic shape; the two .30-06 machine-guns were removed from the bow of the tank and the suspension was altered to try and reduce the weight of the design. However, contrary to normal practice, the Ordnance Department had placed an order for the original T9 design in April 1942, before the T9E1 models were delivered in November 1942; 500 were ordered in April and this order rapidly increased to a total of 1900, with deliveries to begin in November. 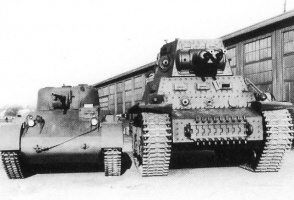 However, production difficulties and design changes caused this date to be delayed several times, and it was not until April 1943 that production on the T9 actually began. Production of the T9 peaked at 100 tanks produced per month between August 1943 and January 1944; however, this number rapidly declined when the results of the British and American testing programmes were reported to the Ordnance Department, and only 830 T9s were ever produced. The faults discovered with the design led to the Ordnance Department giving it the specification number M22, but classing it as 'limited standard'. No American combat units were equipped with the tank, although some of those produced were used for training purposes and two experimental units were formed and equipped with Locusts. The 151st Airborne Tank Company was formed on 15 August 1943, despite concerns that there would be insufficient transport aircraft to deliver the unit into battle, and the 28th Airborne Tank Battalion was also formed in December of the same year. However, neither unit saw combat, due to the US Army's lack of interest in using them in an airborne capacity. The 151st Airborne Tank Company remained in the United States, shuttling from base to base throughout the war, and the 28th Airborne Tank Battalion was refitted with conventional tanks in October 1944. Some 25 Locusts were ordered in April 1944 for use in the European Theater of Operations, and delivered by September; although a small number were sent to the United States Sixth Army Group in Alsace, France, for testing, they were never used in combat. However, the British still required the M22 as a replacement for the Tetrarch and the first prototype Locust was shipped to Britain in May 1942 for testing, followed by the second prototype T9E1 in July 1943. Although they were of the opinion that the M22 possessed a number of faults, the War Office believed it would perform adequately as an airborne tank. Thus the tank received the official title of "Locust" and 260 were shipped to Britain under the Lend-Lease Act. The majority of the Locusts ended up placed in tank parks until they were scrapped at the end of the conflict, and only eight ever saw action with British airborne forces. Extensive testing of the M22 occurred in 1943 and 1944, and was conducted by both the Ordnance Department and the British Armoured Fighting Vehicle (AFV) Gunnery School at Lulworth Military Range. These tests uncovered a number of faults and problems with the Locust. The AFV School noted that the process of loading the M22 into a C-54 transport aircraft took considerable time and involved the use of complex equipment. Overall the process took six untrained men 24 minutes, although it was believed this could be shortened with sufficient training. Unloading was also a long process, taking approximately ten minutes; it was noted that the time it took to unload the M22 from a C-54 on the battlefield meant that both the tank and aircraft would make excellent targets for enemy fire. Operational use of the tank would therefore be restricted to the availability of airfields large enough to accommodate a fully laden C-54, which might not be in the right geographical location or might even have to be captured in advance of a planned airborne operation. A heavy transport aircraft, the Fairchild C-82 Packet, was developed to specifically carry the M22 inside its fuselage and unload it through a set of clam-shell doors, but it did not enter service until after the war had ended. The US Army Armored Board released a critical report on the Locust in September 1943, stating that it was inadequate in the areas of reliability and durability, and indicating that it would not be able to be successfully used during airborne operations. By 1944 it was also realized that the design of the tank was actually obsolete. The armor of the M22 in several areas was found to be so thin that it was incapable of even resisting the armor-piercing ammunition of a .50 caliber machine-gun. Complaints were also made about the 37mm main armament, which was not powerful enough to penetrate the armor of most tanks used by the Axis powers. Similarly a report made on March 13, 1944 by elements of the 6th Airborne Armoured Reconnaissance Regiment complained that when a high-explosive shell was fired from the gun, the resulting shell-burst was so weak that observers had difficulty in seeing where it impacted. There were also mechanical problems with the design, which caused it to be unreliable; the engine was also found to be underpowered, possibly due to problems with the torque characteristics of the engine or an inefficient transmission system.